Be a Beer Taster and Get Rewarded RM 10,000 in just 8 hours ! Who has not fantasized about that dream job? The type where you are out of the office, enjoying an ice-cold brew with your mates? Calling all beer lovers, your dream job is finally here! Are you ready to take your affinity of Carlsberg and impeccable taste buds to the next level? 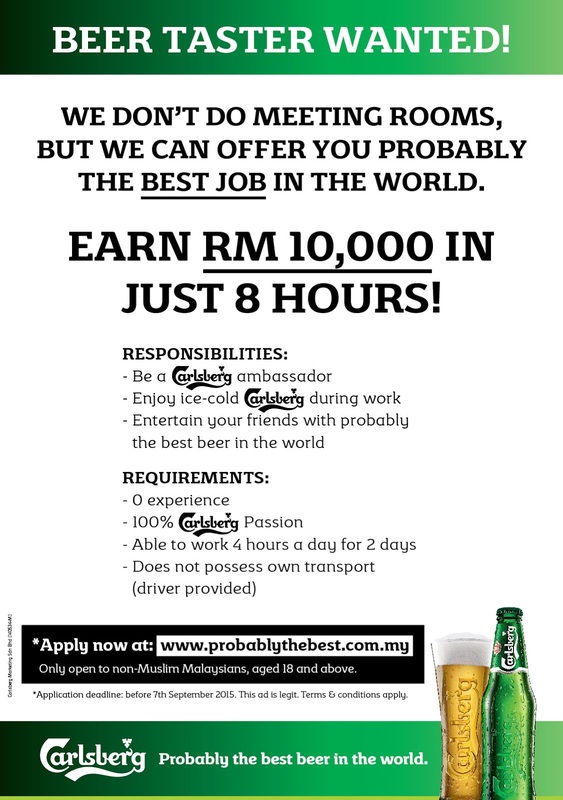 Carlsberg is hiring two beer tasters with an attractive remuneration package of RM10,000 each for only two days of work, 4 hours each! Sounds too good to be true? Well, it only gets better because the two successful Carlsberg candidates do not need to possess any experience or educational background relevant to the beer industry. All he or she needs is a burning passion and 100% love for Carlsberg brew and to be available for 2 days, undertaking the role of a Carlsberg ambassador. What sort of ‘work’ is required? 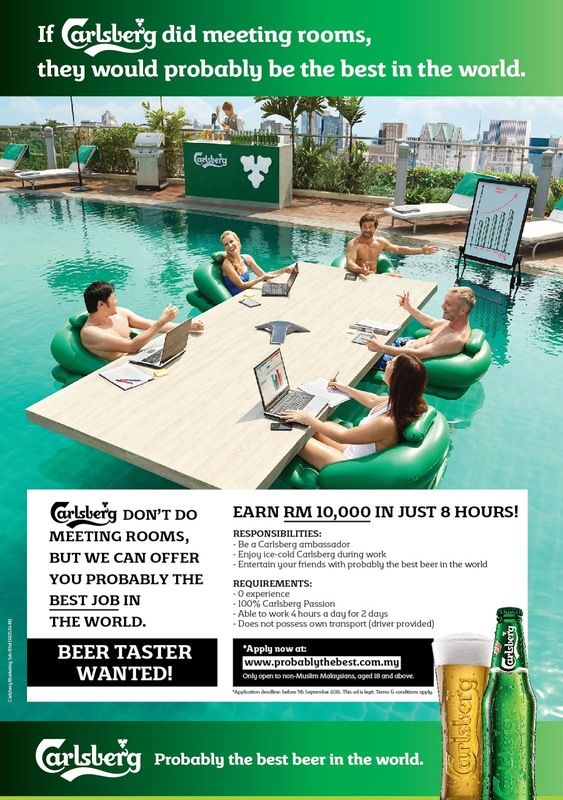 Carlsberg figured, what could be more enticing than to get paid to enjoy probably the best beer in the world, hang out with friends, and simply have fun? Worry about your transportation to and fro, especially after a beer? We have that covered too. Carlsberg has hired a personal chauffeur to ensure you enjoy the brews responsibly! This is a valid recruitment advertisement which is part of the brand’s “If Carlsberg Did…” campaign launched in June this year. The recruitment ad is an extension of the latest video of “If Carlsberg Did Meeting Rooms…” which offers a refreshing take on a typical man on his way to a meeting. To the sheer delight of audiences, the man walks into an unconventional setting where the meeting was conducted in a swimming pool. “In a world full of mundane meeting rooms with bare walls and enclosed spaces, employees are lacking inspiration at work. If some-one had to step in and make meeting rooms extraordinary, it would be Carlsberg. However, we only make beer”, said Juliet Yap, Marketing Director of Carlsberg Malaysia. Amplifying on the brand’s trademark humour and imagination, Carlsberg will not be following the typical hiring policy but expects candidates to step out of their comfort zone in an unconventional hiring route. This dream job is only open to non-Muslim Malaysians aged 18 and above. You can apply for it at www.probablythebest.com.my from today until 7 September 2015.